Four year old Maria set her dresses on fire and chopped off her hair. Her father watched, nodded, and provided her with her older brother’s clothing and a traditionally male name. She was free. 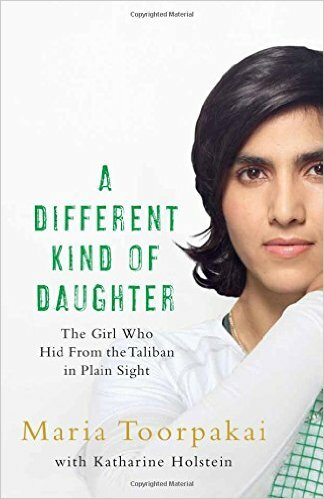 A Different Kind of Daughter: The Girl Who Hid from the Taliban in Plain Sight is writte n by Maria Toorpakai and Katharine Holstein. I learned more from this book than almost any other I have ever read. As a nonathletic, book-loving, “feminine female”, homebody anchored most closely to a liberal take on Christianity and living in the Western world, this book widened my eyes by degree upon degree. The experience of a person identifying as neither or both male/female in a region that determines everything according to gender. For some, the drive to—and deep soul peace derived from—sport. The determination to live authentically-gendered in a space that relies on one not doing so. The experience and result of unschooling by choice, in a region where one knows they are already lucky if school is an option at all. The free-range childhood of one, the risks inherent, the jubilation inherent, and the finding of one’s way from very young. The incredible capacity of a small child—given enough room—to work, to contribute, to consider, to care, to develop strong life skills. The strange, random hatred inside too many individuals in any given region. The series of events that allows such hatred in some to boil into full-fledged war on a region’s own people. The powerful effect of compassionate, determined co-leadership of a family in impossible circumstances. The theory that sport or writing can divert many people from choosing violence. I admit, much of the content was stressful for me to even read. As a woman who has lived the risks of living with no money on the streets, and having been threatened and battered untold times, the read was tough psychologically. I’m so glad I didn’t let my stress-response stop me. Lyrically co-written, the book is also profoundly important in content. Given the poverty, shortage of nutrition, and punches to the face, how did her teeth, for example, heal from beating after beating? In this region or circumstance, what is a person’s usual carbohydrate content in a day? Is it high or low, and how does the level affect one’s overall well-being? How much of the book was drafted by Maria herself? In this book’s case, what does “written with” mean? Given that the extreme abuse of one’s fellow human seems to begin in the minds and hearts of some, how do we halt that trajectory? How do we reach the minds and hearts of infant, toddler, and young boys, such that they reject such gender-based cruelty and refuse to participate in it upon reaching agency? What are the factors that led Maria’s dad to do this? How do we help the situation right now? Is there a way to support people to stay in their home region, as so many prefer, and experience freedom and safety? Is there a way to transition those who need to leave, but into a warm, supported environment with full opportunities? This book filled my heart, soul, and mind. The emotional difficulty I felt in encountering some of the content meant I needed to move slowly through it, pacing my heart. Obviously, though, my struggle in witnessing it from the reader’s distance does not begin to touch on that of people going through the living experience. I’m so grateful Maria’s story to this point has been told. Have you read this book? What was your experience in reading it? Have you researched how we can all help? What have you found? Thanks for alerting me to the existence of this book – I am putting it on my ‘to read’ list! One of my favourite things, Joon, is seeing what questions you come up with for things. I would never have thought to ask those questions!